My father, William S. Paley—for whom this Festival is named—was the founder of The CBS Network. In 1926 he was able to picture how a mixture of entertainment and advertising could create a medium that would enthrall America. His vision, eye for talent, and programming acumen allowed a small collection of independent stations to become a robust national network. 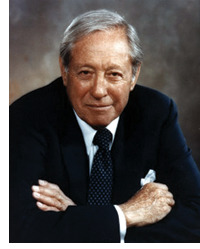 William S. Paley’s insistence on exceptional talent, high production values, and commitment to the news division led CBS to be labeled the "Tiffany Network." I remember watching pilot episodes with him at our home on Long Island and his telling me some of his criteria when judging a show. He said that for a show to be successful you had to like the characters enough to want to invite them into your home. His insistence on excellence and understanding of the public’s desires led to CBS being in the number-one position for decades. It is fitting that this Festival, which celebrates the best of television, be named for the innovator who embodied the quality of knowing great talent when he saw it and knowing what the public wanted. One of the nicest aspects for me when attending the Festival is sharing an experience—which is usually solitary—with hundreds of other people and seeing the creative talent of my favorite shows interact with their public and their fans. The biggest names in television are often hugely affected by seeing, often for the first time, an audience responding to their work in real time. We at the Paley Center are thrilled by the ever-growing popularity of the Paley Festival. Past Festival evenings have been preserved and are available for viewing at the Center, located at North Beverly Drive and Little Santa Monica, and at our facility in New York. I hope you have the opportunity to visit The Paley Center for Media and experience our marvelous, rich collection.